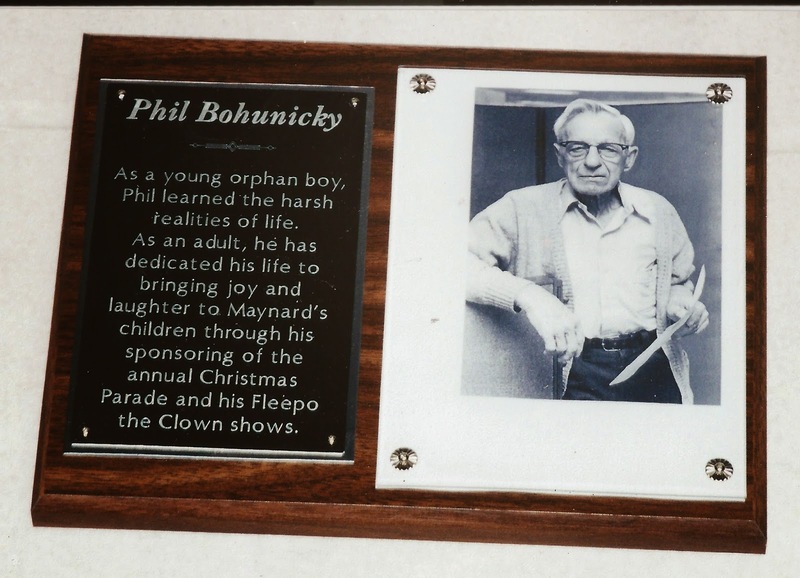 Ten years gone since Philip W. Bohunicky, aka "Fleepo the Clown" passed away on 11/11/04, a month shy of his 85th birthday. 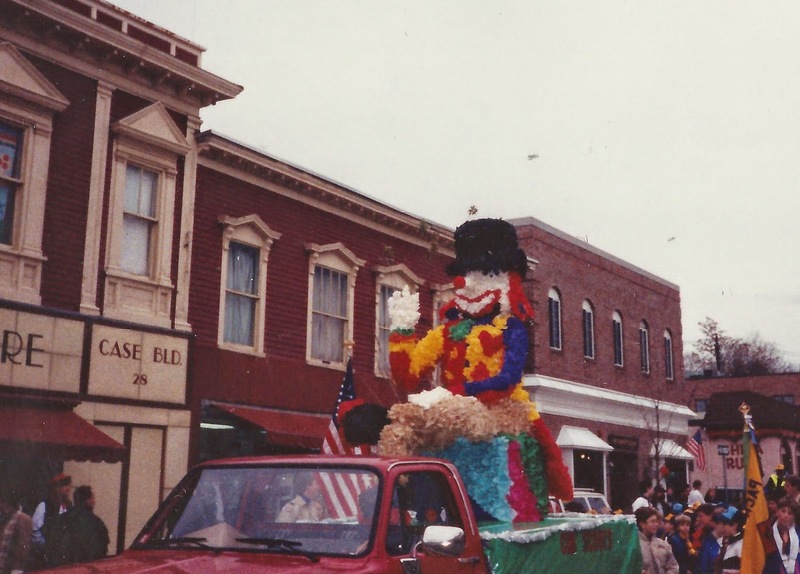 He had been a fixture in Maynard's parades and celebrations for close to 40 years. He, as have others, qualified for the honorary title "Mr. Maynard" in his time. Phil wrote up part of his life's story for the Maynard Historical Society shortly before he died. 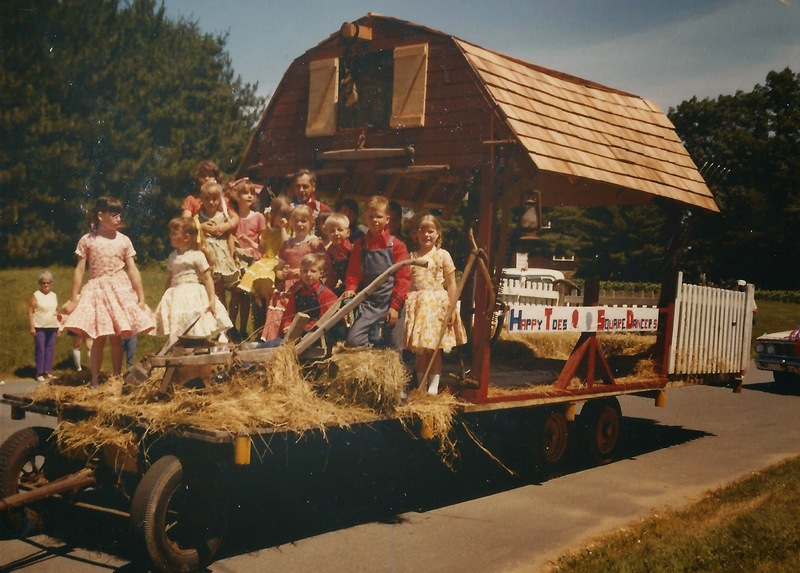 As he told it, he began sponsoring and coordinating Maynard's Christmas parade in 1966 because of an event from his youth. His early memories were of growing up in a Catholic orphanage. He described a snowy winter evening when the nuns told the boys that after evening prayers they were to put on their winter outfits. They walked to the center of town, where he heard a small band playing "Jingle Bells, Jingle Bells..." and everyone joined in to sing Christmas carols. In his own words "All of a sudden a huge red fire engine appeared around the corner with its sirens and horns blasting away. Standing in the back of the fire engine was a huge Santa Claus waving and yelling 'Merry Christmas, Merry Christmas, Ho Ho Ho!' As Santa faded slowly in the distance I was mesmerized, and to this day, oh so long, long after, I never forgot when I first saw Santa Claus when I was only six years old and living in the orphanage." In addition to starting the Maynard Christmas Parade tradition, behind the scenes he also personally covered much of the cost of putting on the event, a responsibility since taken on by the Rotary Club. Phil also organized the annual Easter Egg Hunt at Crowe Park and helped provide entertainment at the Fourth of July carnivals - same location. At many events he was joined by his children and others who performed as the Happy Toe Square Dancers. 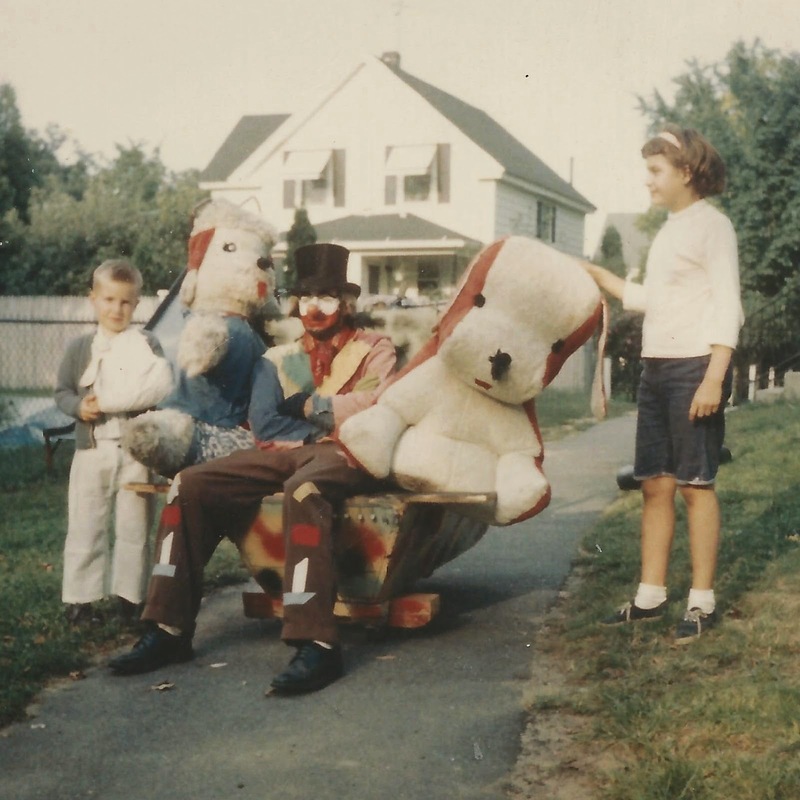 Phil's main alter ego was "Fleepo the Clown," but he also put in appearances at children's and charity events as Grandpa Fleepo or Harmonica Phil. Many Maynardites remember Fleepo on WAVM's television channel as The Fleepo Show. Or in costume, on roller skates, handing out lollipops. Or seeing him drive by - in costume, on his way to an event - with a very, very large stuffed dog in the car as his sidekick. His license plate read FLEEPO. One story that made local news in April 1990 was that Fleepo was hatjacked of his signature antique top hat at the Easter Egg event. The hat was never recovered. Fleepo, stuffed animals, perhaps two of his three children? As to how his clown name came to be: Philip apprenticed for years with Chris Sclarppia, who went by the clown name "Bozo" (not the famous Bozo). Chris took the French pronunciation of Phil's name - think "Fe-leeep" - and from there mutated it to "Fleepo." Out of costume, Bohunicky put in uncounted hours supporting Little League baseball, T-ball and the water safety swim program conducted at Lake Boon. He had served in the Army Medical Corp in Europe during World War II, and appeared in uniform at Memorial Day and Veterans Day remembrances. His post-war career was as an electronics technician at MIT's Lincoln Labs, in Lexington. He died on Veterans Day, 2004. This is not to say that Philip Bohunicky was all sweetness and light. In his involvement in various town government activities and volunteer groups around town he was at times strongly opinionated and ornery. Little is known about Bohunicky's early family history. One source mentions both of his parents dying when he was an infant, and with no other family member to take him, he ended up at St. John's Catholic Orphanage in Utica, New York, until he was eleven, and then with a series of foster families. His good luck was the last family insisting he attend high school, and then the G.I. Bill putting him through Massachusetts Trade School. The surname Bohunicky is Slovakian, and can be taken to mean from Bohunice," which turns out to be the name of a small village near the western border of the Slovak Republic. If his parents were immigrants from that region it was part of the Austro-Hungarian Empire back then. Phil's contributions to town spirit continue to be remembered. Each year, the Philip Bohunicky Humanitarian Award is presented at the WAVM banquet to a member of the town who exemplifies the same type of dedication to his/her community.